The unique choise for those who seek quality during their holidays. Within a walking distance from the center of Paralia near Katerini and just 80m from the expansive coast with the golden beach.Mediterranean flavours and dishes, a rich cellar and wine vault and of course refreshments. Sink yourself in an armchair and enjoy your drink at the bar or the swimming pool.Our 68 fully equipped rooms correspond to all your demands and offer you calmness and relaxation. For moments of absolute personal treatment and health during all the seasons of the year, you can exercise yourself or swim in the indoors swimming pool. Immediately after that relax with a jacuzzi or enjoy a sauna. For your professional conferences there is a specially designed place for presentations and conferences with all the modern equipment which is formed according to your needs. 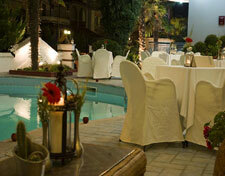 Our hotel is a four star hotel that has 68 luxurious rooms, very comfort and factionalism to the visitor. They are carefully decorated to offer a unique atmosphere and relaxation during your stay. Excellent service is offered at the cafe. Snack bar serves all kind of drinks and snacks. At the restaurant, enjoy a delicious breakfast and dinner, served in buffet to satisfy all tastes. Dine in style in a beautiful atmosphere and experience the unique specialities of our chefs.